I’ve got no good excuse to have waited so long to get to this under-the-radar regional smoked meat house. But bottom line? I’m here and I’m happy. Happy because this spot is doing something no other place seems to be doing in San Diego. Serving sandwiches that represent different areas of the country with deep, traditional roots in their recipes. 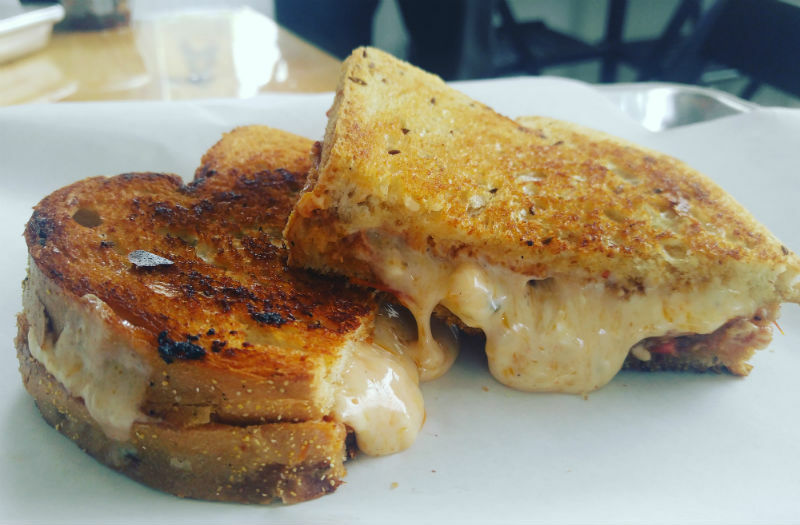 The grilled cheese served here with a variety of cheeses, pimentos, tomatoes and a whiff of bacon jam on toasted, marbled rye, is a tribute to the southern part of the U.S. 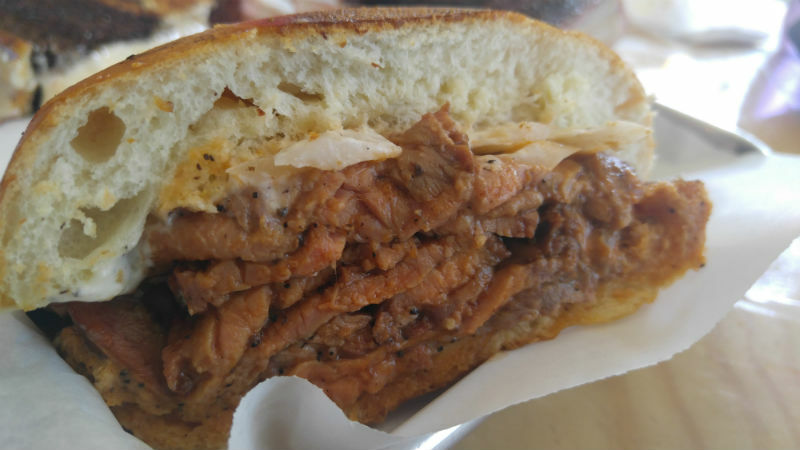 This is currently my favorite sando in SD right now. Dare I say it’s unctuous? Just did. Owner, Chris McAfee is a hard working man. 5 nights a week you can find him tending bar at the Hard Rock Hotel. A full time job. Then there are his two new babies, both under two years old, that I’m sure he’d like to see more of. Then there’s the restaurant, a basic shack with just a few tables. You know how they say you want to get something done, you ask a busy person to do it? Well, this must be true because he made his dream come true with the Smok’d Hog. 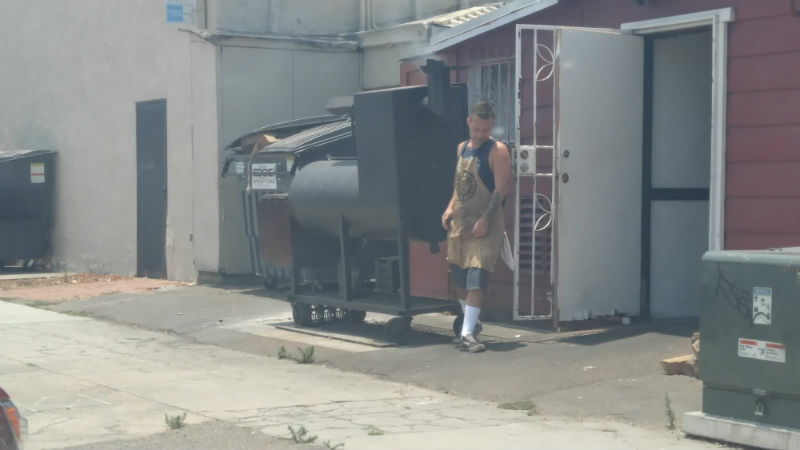 And lest anyone doubt he’s actually smoking his meats, his smoker is right out back of the place. Here is what he has to say about that. 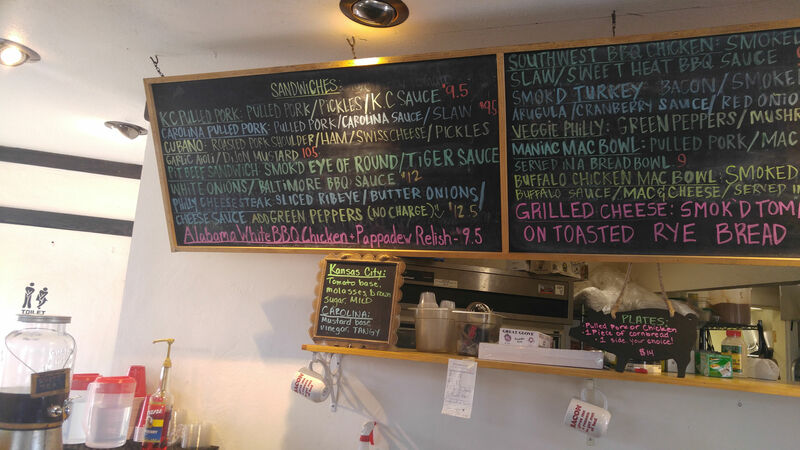 I was quite excited to see that he’s doing an Alabama White Sauce on pulled chicken. I haven’t seen this sauce on anyone’s menu here. This sauce is the concoction of Big Bob Gibson from AL who brought this mayonnaise and vinegar based sauce with added herbs into the nation’s eye. While Chris doesn’t have enough room at this point in his kitchen to make whole pieces of crispy skinned chicken as it’s usually served on, it’s still delicious poured over his perfectly moist, smoked pulled chicken. Please excuse my cardboard boxes, as I like to try a bit of everything on my first few visits and just ask for a taste. This is not how it will be served to you of course. 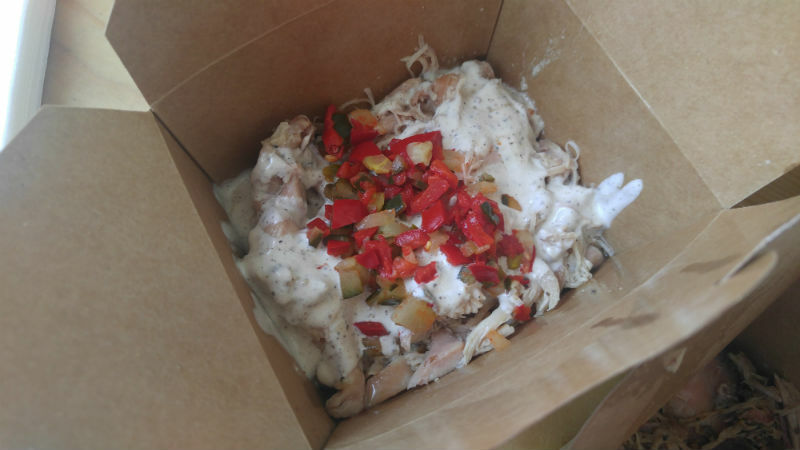 Pulled chicken with Alabama white sauce. Next up, his Pit Beef sandwich which hails from Baltimore. He serves this Inside Round cut on a bun with some horseradish sauce mixed with a bit of lemon. It was very good and satisfying. The Cubano I tried was good, but not my favorite. But to be fair, no one out here serves it exactly as it should be served on the correct bread. You just can’t get real Cubano bread out here. I’ve had them in Miami and it does make a difference. I haven’t tried his Philly Steak yet, and not sure how smoked meat on that old stalwart would fare. 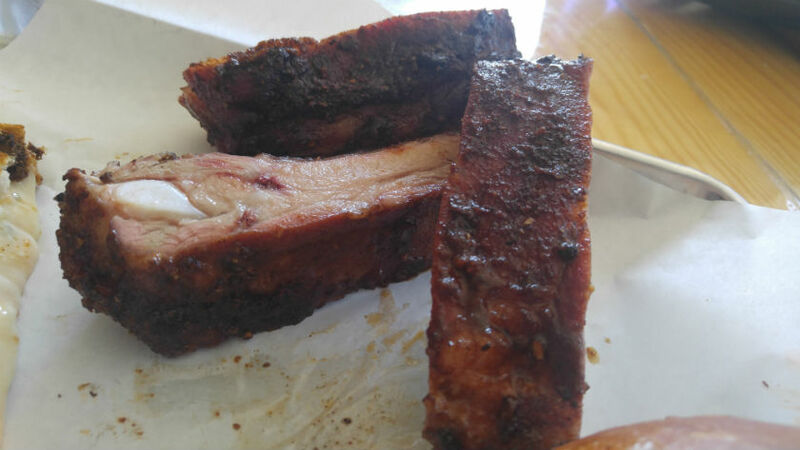 But I absolutely loved the dry spice rub he puts on his pork spare ribs which are only served on the weekends. Other than a very good pulled pork sandwich, this is his only other traditional BBQ meat offering. Brisket is served only for caterings. Probably a good idea, as we discussed how difficult it is to maintain moisture in this tough to work with piece of meat. Back to the ribs. His proprietary rib rub has coriander, cumin, allspice, cloves, New Mexico chiles and salt and pepper. I wanted to just lick the rub right off of those meat slabs. Very tasty. 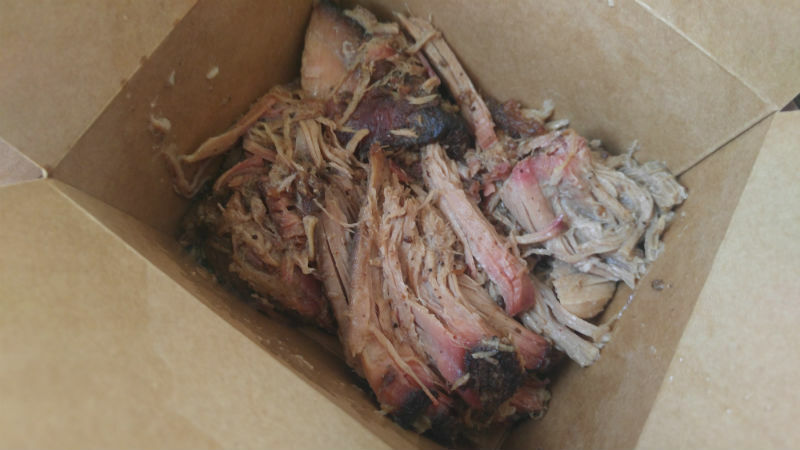 Pulled Pork, usually served on a bun. There are quite a few more sammies I need to try and I better hurry, as his menu IS seasonal. He says he changes it up every 4 months and at the end of summer it will change again. Mostly the left side of the menu above will stay the same (of course my grilled cheese is in the middle part of the menu!) So, if you have a hankering for anything you see here on this review, you better call first to make sure it’s currently being served. He even suggests you do that with the ribs on the weekends which also go fast. I would be remiss if I didn’t mention how amazing his sauces are. All on the side of course. But his Carolina Gold, which is mustard based, is so good, that I mix a bit of his sweet hot in it and I ate it with a spoon, it’s that tasty! Fantastic on the pulled pork and I even dipped my ribs in it! He makes a mighty tasty, sweet Kansas City sauce too. But he says the Carolina is his most popular. 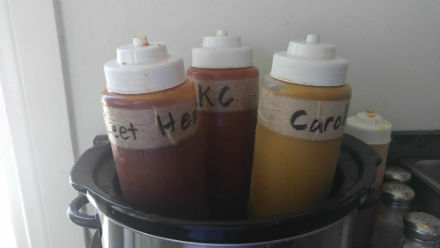 Scratch made sauces are the star of the show here. And here is a place that pays attention to it’s side dishes. 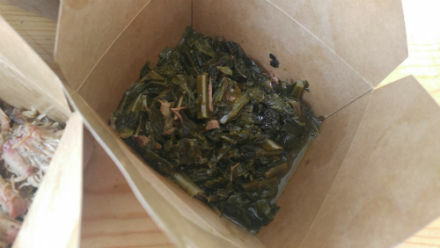 His greens with ham hocks, rib tips and pork are right up there with Iron Pig’s and his beans have rib tips in them too! Oh yes, so very good. He also serves a refreshingly icy sweet tea. 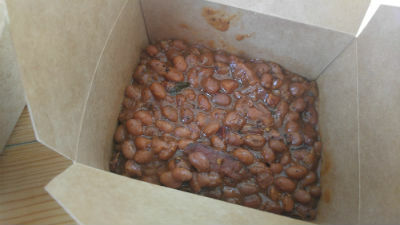 Baked beans with rib tips. Right now he’s doing specials on certain days. I’ve got to get back here and try his fried chicken on Fridays. I’m actually pretty excited to see what’s going to be on his next menu, as he is a bit of a risk taker when it comes to regional sandwiches as evidenced by smoking the meat on his Philly. Da Smoker that you can smell before you pull up.